Wondering, how to make Indian hair style at home without visiting your parlor’s coiffeur (Hair Stylist). If yes, then News Flash! We’ve just curated pictures + instructions based tutorials of doable Indian hairstyles for girls and women too. Go through our selected hairdo(s), for they are not as difficult as Origami. Whether you’ve long hair, medium hair or short hair, our selected easy hairstyles to do at home are for every occasion. From cute Indian bun hairstyles to cult South Indian hairstyles, from gorgeous Indian party hairstyles to goddess-like Indian bridal hair style, you can learn everything from us, Bae. 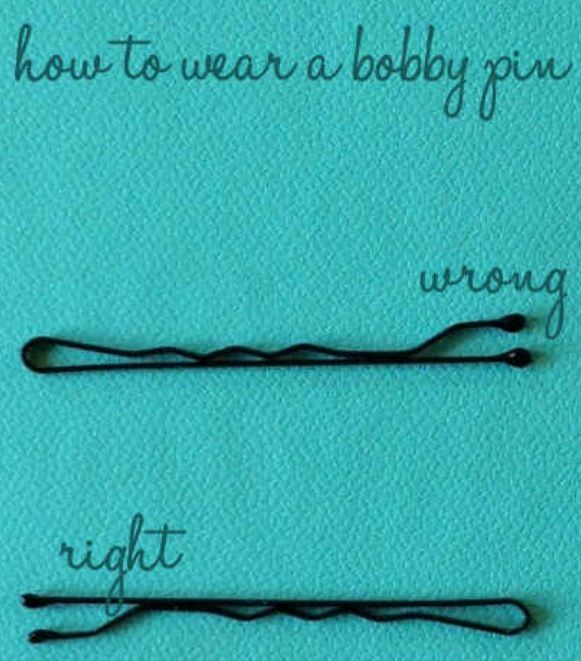 Since there are various types of bobby pins, thought this would avoid the confusion. Note: When you will use a bobby pin, the wrong way, your hair will more likely break the time you will try to remove it from your hair. This will help in detangling your hair, quickly and easily. This will help in precise sectioning or parting of the hair. You should replace it with Wooden Combs as shown in the picture above. Such combs are made out of the wood of sandalwood tree, neem tree, rosewood tree, and other such herbal trees. With Wooden Combs you could avoid breaking of hair, drying of hair due to combing and static hair problem too. Hence you should invest on wooden hair combs. For setting your hairstyle and for keeping it frizz free, instead of using a chemical infused hair spray, make your own hair spritz at home. Take a Spray Bottle and fill its 2/4th with water.1/4th of Glycerin and 1/4th portion of Olive Oil should then be mixed in it. Shake well the bottle before use. Then soon after you finish styling your hair, spray this homemade hair spray on it. This will help the hair frizz free and manageable for a considerate time. Note: Use this only on special days and events. Let us guess where you go daily, sports club, practice sessions, college, tuition, or may be shopping! For your casual western wear look, we have piled up many attractive yet easy-to-make hairstyles. Just promise us one thing; you will keep on practicing new hairdos every day. And if you are more into ethnic or Indo-western clothes, we guess you may like our curated hairstyles in Traditional Ethnic section, below. Comb your hair first. This is to even out all those tangled hair. Part your hair into two as if you are going to make its two ponytails. Bring your entire left side’s hair towards your right and rubberband it. Likewise, bring your right side’s hair towards your left and braid it. Braiding should be done from the top of the head, not from the side of the ear. Take hold of the braid you made and then wrap it around your ponytail. Wrap it, as if you are trying to cover the ponytail’s rubber band with your braid. Soon as you reach the end of the braid, take a hairpin and fasten the left out hair onto your head. Lastly, accessorize this cute looking, Half Braided Side Ponytail with a decorative hair pin. Firstly comb and side part your hair. Then back-brush your front hair (i.e. hair above your ears) and tie it together with a rubber band. Now get hold of your tied hair, make it stand straight and twist it till its end. After this wrap your twisted hair around the rubber band, for making its bun. After coiling it, till its end, take a hairpin and fasten the left out hair onto your head. This is to keep your bun in its place. You can make a separate thin braid with your hair wide open. This braid would look more like a hair extension. Evidently, it would add extra oomph to your look. Comb out your hair. Then take hold of the front hair which is just behind your ears. You should make two front braids on both the sides of your head. If you want instead of four thin braids, you could make only two thick braids on each side. Now back-brush the hair just above your forehead. Then bring one of the left side braids towards your right, pin it up behind your right side’s ear. Next, bring any of your right side braid on the left side. Pin the same behind your left ear. Repeat Step 5 and 6 with the remaining two braids. That’s it, you will be ready to step out. Comb and side part your hair. Take hold of the front’s hair, its width should be thick enough to make two visible ponytails out of it. Divide the same hair into two parts. Now our first part is that portion of hair which is near to your forehead. And the second part is that portion which is away from your forehead. You should not lose your hold on both the parted hairs. Now take a fresh hair piece, situated next to your hair’s second part. And join it with the first part of your divided hair.Take a piece of hair from the first part of your front’s hair. Then place it in between the first and second part. Now start braiding, your hair in the same method as stated above. When you finish braiding tie a rubber band at its end. Repeat the same procedure to make the second new braid. The left out hair of the two braids can again be braided, only if you don’t want them to swing like a pendulum when you walk. You should always comb your hair before styling it. We think hair pinning styles from 1 to 5, above would look good on side-parted hair. We are saying so as many part their hair from the middle as well. While pinning your hair in any of the styles illustrated above, all your pins should be of the same size. We would say, if your hair is thin in volume go for medium sized pins, for a better grip. Otherwise large sized pins would be good for voluminous hair. Part it from the middle with the help of rat tail comb. Take hold of the front hair, i.e. hair at the center of your forehead. Divide it into two and start twisting it. Twist it tightly, so that you could make it look thin like a lace. Then pin it under your hair. Don’t expose your hair lace, by pinning it on your head directly. Repeat the same thing with another side of your hair. Detangle your hair with a wide tooth comb and side part it with a rat tail comb. If you have side parted your hair from the left side, grab the front hair of the left side hair and vice versa. Hold that hair only which is above your ear. Start braiding the same. If you think your braid might get open, you could rubber band its end. After this lightly pull out the hair of the braids and it’s done. Comb your hair and side part it. Take hold of your head’s front hair. Bring it in front of your eyes. Remember that you will have to make a hair puff out of it. So grab as much hair as you can. Hold your hair from the middle. Now slowly start twisting it inwards. Twist your hair until you get your desired puff. Don’t let go of the hair; keep on holding it from the middle. Then use a Barrette Hair Clip or a decorative Snap Clip for pinning your hair onto your head. Clip the hair just above your ear. Comb your hair, side part it. Then take your front hair, i.e. hair close to your forehead and start braiding it. At the braid’s end, you could use Hair Ballies that are more like rubber bands, for tying your braided hair. Or else you could use a hair bead, to clip your braided hair. Hair beads are usually used when then braids made are thin. Now, slightly pull out the hair of the braid. Here you will find such workplace hairstyles that won’t make you feel conscious about your professionalism. Besides, it’s not a sin to look decently a stunner at work every day. Here we have selected some neatly formal hairstyles that you can be tried for: Interviews, Office hours, Office Parties, Seminars, Conferences, Presentations, Meetings, Summits and other such places where work is involved. After combing your hair. Side part it. Divide your hair into three. The hair falling on both the sides of your shoulder should be separated from your head’s back hair. Now simply tie a rubber band around the back hair, for making its ponytail. Further, divide your front’s (shoulder) hair into two. Twist fully one of its strands and wrap it around your ponytail. Try to insert the end of the twisted hair under the ponytail’s rubberband. Perform Step 3 with the front hair of another side too. The second part of the front hair should now be twisted. After twisting wrap it around your ponytail but this time, pin the twisted hair’s end onto your head with a bobby pin. Step 5 should be executed again on the other side of front hair. After this, you will be a work-ready. Comb and back-brush your front hair. All your hair which is above your ears should be brush-brushed. Tie it with a thick rubber band then. Consequently, you will make its ponytail. Now divide this ponytail of yours, into two. Start twisting these two hair strands with each other, like a rope. With this, you will make a twisted braid-like ponytail. Use a thin rubber band to tie its end. Now lift up your twisted ponytail and make its bun. Use a bobby pin for pinning the bun’s end on your head. Such kind of bun is called the ‘Rose Bun’ because after being made it looks like a rose. First comb and side part your hair. Now divide your hair into two as if you are about to make its ponytail. Then use one Condor Clip for clipping right side of your hair. Use the clip on the middle portion of the right hair. Condor clips are to be clipped horizontally; they should not be slanted. Use the other Condor at the bottom portion of your left side’s hair. Now overlap your right side’s hair with the left side’s hair. In other words, cover the right side’s clip with your left side’s hair. This way you will bring the left side’s hair towards your right. But then you should take back the same hair towards the left side, from underneath your right side’s hair. Now take off the clip on your left side hair and use the same clip at the meeting point of left and right side hair. See that you use the clip under your hair. Even in the image above, no hair clip is visible. In all this process, don’t forget that your hair should still look side-partitioned. Hence from the top, separate the left side’s hair that has merged with your hair on the right. Use large pins, so that the ponytail doesn’t get loose. Comb and side part your hair. Now grab your head’s front hair. The grasped hair strand should be thick in width. Start twisting that strand from the middle. This means the top portion of the front hair should remain untwisted. Then with a large bobby pin fasten the strand’s end onto your head. Now for just once, twist that untwisted top portion of hair, upwards. When you do so, use a small size hair pin to keep it puffed up. Comb and side part. Take the right side’s front hair on your hand and twist it back for once. Then pin it up, by raising up the twisted hair. Thereby making it look like a side puff. Now the hair just behind your right ear should be pinned at the back of your head. Speaking about your left side’s hair. Get hold of the hair just above your left ear, sweep it towards your head’s back and pin the same. Now and your hair is ready to leave for work. Comb your hair and back brush your front hair. Now take hold of the hair, just above your ears. Tie those two hair strands together with the rubber band. After this, hold the hair present just behind your earlobes (viz. the lower part of the ear). Twist the same. Lift up the tied hair. Insert and entwine the twisted hair around it. Do the same thing on the other side of your head. At last tie together all the four hair strands with a rubber band. First, comb to detangle your hair. Back brush your front’s hair and pin it up. The hair present just above the ear should be brought towards your head’s back. The same should be pinned there. First, pin the left side’s hair and then pin the right side’s hair over it. After this, you should get hold of the hairs behind your earlobes. Pin them too at the back of your head. Comb your hair and part it from the middle. Now take hold of the front hair, present on both the sides of your head. Tie those two hair strands together with a rubber band. After this, hold the next strand of front hair. Lift up the tied hair. Insert and entwine the new strand around it. Wrap around the new hair for at least 2 times. Do the same thing on the other side of your head. At last, after all twisting and entwining, with a light hand pull out the twisted hair from its side. To make your hair look fuller. Comb and detangle your hair. After this side part it. Then back brush all the hair, near to your face and pin it up. Do the same thing, on another side of your hair. With such a hair style, your face cut will appear sharp and clear. Also if you have any hair bangs, they too will get swept back neatly. Whether you are attending once-in-a-year parties like fresher’s party, farewell party, or reunion party. Or every year’s parties like wedding reception parties, birthday parties or New Year parties, for us party is all about looking glamorous with glam hairstyles. So all you party-goers see our party themed hairstyles only if you secretly wish to look more ravishing than the party’s host. And if you yourself are going to be the host of a party, then don’t let any regular hairstyle spoil your irregular party look. Detangle your hair with a wide tooth comb. Now section your front and back hair with a Rat Tail Comb. Make a ponytail of your back hair by tying it with a rubber band. Now you will have to divide your front hair into two. Further, subdivide those two hair strands into two. This means you will have to make a braid using four strands of hair. Usually, we make braids with three strands of hair, isn’t it? Now at first, you will have to braid 1st and 3rd strand together, after this the 2nd and 4th strand is to be braided together. Continue braiding until you reach the strand’ end. Now pin up half the braid onto your head, at a point just above your ear’s tip. After this, the same braid should be wrapped around the ponytail, for once only. With the left out part of the braid, you can increase your its length, using the open hair of the ponytail. Thereby a new braid can be joined with the old one. First comb and side part your hair. Now start braiding hair from the top of your head. Usually, to start braiding we first make use of the outer hair strands (labeled as ‘A’ and ‘C’ on the image above). But you should begin braiding, using the middle hair strand (i.e. ‘B’). After the first braid, bring left side’s hair towards your right. Think that you will have to braid your entire hair on the left side of your head only. The braiding mannerism will be same as discussed in Step 2. You will see that you have made a single sided braided ponytail, by following Step 2 and Step 3. Now grab the ponytail’s end, to make a U-Shape out it. In that upward direction only, you will have to coil the braid till your earlobes point. After this pin the bun’s end, properly. Use hair pins on all those vulnerable spots of the bun due to which it can get unrolled from your hair. Comb your hair nicely. Then back brush your head’s front hair (i.e. all the hair that lies above your ears). Divide it into two thick parts, here as you can see in the image above those two parts have been tagged as part 1 and 2. Now forget what’s shown in the picture and listen to us. Hold your hair tightly and erectly, otherwise, your ponytail will get all loopy. Now take out some hair from lower part of 2 and think it to be 2-A (Labeled as number ‘3’ in the picture above). Keep 2-A in between part 1 and 2. Now join 2-A and 1 with each other. With this amalgamation, the 2-A portion will cease to exist. After this, you will have to separate the lower portion of Part 1 and think it to be 1-A. Place 1-A in between 1 and 2. Now join 1-A with 2. With this 1-A existence will come to an end. Your next’s 2-A will your right side’s back hair, viz. the hair that you didn’t back-brushed. And the next 1-A will be your left side’s un-brushed hair. Braid them the same way as stated above. Keep on braiding your hair till your neck portion. Then take an embellished rubber band and tie your hair with it. Now keep the rest of your wide open. Comb and part your hair from between. Now take front hair and start braiding it from the top of your head. Even out your head’s back hair, with a comb. Make another side’s front hair braid. Now pin up both the braids on their respective sides from the middle portion. After pinning the braids, rubber band your hair, entirely. Now braid your ponytail and tie its end with another rubber band. Coil your braid and make its bun. Fasten the bun’s end onto your hair with the rest of the two hairpins. After combing your front hair backward. Divide it into three. Twist the first two strands of the divided hair with each other. First, two strands (1 and 2) will be those hair strands that are away from your ear. The hair strands nearby your ear is the third strand for us. Got it? Now the 3rd strand should be placed in between 1 and 2.
hair on your right side. Hence you won’t have to use it again, forget about it.Then take a new hair piece from the left side, make it your brand new 3rd hair strand. Repeat the procedure stated from point [C.] to point [D.]. Keep on making waterfall braid like this, until you reach the lower portion of your right side’s head. Tip: Take nice thick hair strands for making the waterfall braid. Then only its design will be visible from afar. The waterfall braiding will end when you will touch the earlobe of your right ear. Take a rubber band and make a ponytail of the remaining hair. Twist and roll the ponytail into a bun and pin the same. If your hair’s slippery or if you think the bun will come off easily. Make a braided ponytail and make its bun. Then secure its place on your head using bobby pins. Detangle your hair with a wide tooth comb. Then side part it. Brush the front hair on your left side with a Bristled Hair Comb. If you don’t have a bristled Hair Brush as an alternative you could also use a fine-tooth comb. After this, grab the hair near and around your sideburns. Pair it up with the hair situated somewhere at the middle of your head. Start twisting both of them together. Twist them, until you reach the ending point of the sideburn’s hair. Then take a hair comb pin and clip the two hair strands with it. After this you will be ready to roll! Comb and section your hair into two. Your front hair should be separated from your back hair. This can be done finely with a Rat Tail Comb. Manage your head’s back hair with a Condor Clip. Now it will be easy for you to braid the front’s hair. Divide your front hair into three sections. Braid each of its section. By doing so you will get three hanging braids. Using a rat tail comb or any fine tooth comb, just comb the ends of all the three braids. Now hold all the three braids together, by their end. Take it towards the back of your head as much as you can. Then pin up all the three braids using two bobby pins. Cover the same pins with your hair and it’s done. The first fundamental rule of hair styling is to comb hair for detangling it. Hence even when using bobby pins on hair, first detangle it. Above, some of the modish and look-transforming ways have been given, for using hairs pins on short hair. This can prove to be very handy, especially when you don’t have time to style your hair at all. Comb and back brush your front hair. The portion of hair which is right above, your eyebrows should be pinned at the back of your head. Then take hold of the hair just above your ears. Start twisting it. When you will twist them till the end, pin it up on your head. Do the same thing with hair on your head’s other side. Take a Bow Pin and place it in the center of your head, i.e. that focal point where all the hairs have been pinned together. Hairstyles for college’s Ethnic Day to celebration laden festive days, your Indian Beauty look, would be incomplete without some truly Indian hairdos. Whether it is Navratri’s Garba dance nights or Eid’s party nights, we have such hair styles that would go well with almost all kinds of ethnic wears. Comb, back brush your front hair. Then bring together all your hair by tying it with a rubber band. Now divide your ponytail into two equal parts. Start twisting the first part like a rope. Rubber band it temporarily until you finish twisting the second part of your ponytail. Soon as you finish twisting both the parts. Remove the rubber band from the first part of your hair. Now entwine those twisted strands with each other. After this use the same thin rubber band to tie up your hair, at last. Comb and detangle your hair, first. You can either side part your hair or section it from the middle that’s your call. After parting your hair into two, make its braided ponytail. Tie each of them with rubber bands. Now with the help of your fingers, make a hole/gap at the upper part of your left braid. Pass your left’s braid through that hole/gap and take it to the right side of your hair. Then pin up the braid’s end onto your head. Redo the Step 3 and 4, while taking your right side’s braid towards your hair’s left side. That’s it. Now go, adore yourself, on the mirror. Comb and detangle your hair, first. Now part it from the middle. Make two braids out of the parted hair. Keep this in mind that the braid should start from the crown (top) of your head and not from your head’s sides. Braid both the sides of your hair, backward. After this, make an ‘X’ sign with both the braids by making them cross each other. Now for your convenience, we suggest you use a rubber band for tying the two braided ponytails. After that, you can start twisting them together. When you will be done with Step 3, start coiling your ponytail around the rubber band. Coil it into a bun. At last, pin up the end of the bun onto your head. Detangle your hair with a wide tooth comb. Then side part it. Now bring your left side’s hair towards the right side. Hold all your hair together. Twist it inwards. Twist it sufficiently so that you are easily able to rubber band your hair. Twisting hair is nothing but giving your hair, the structure of a rope. After considerate twisting when feel like your hair has been twisted into a solid rope, tie your hair together with a rubber band. Comb and side part your hair. Divide your hair into four sections. The hair falling on both sides of your shoulder should be separated from the back’s hair. Split your back hair into two. Thereby, you will create four sections of your hair. Now simply braid those four strands of hair. After this pin up the second braid’s end at the top (starting point) of the third braid. The third braid should be pinned at the top (starting point) of the second braid. Likewise, the first braid should be pinned at the starting point of the fourth braid and the fourth braid should be pinned at the starting point of the first braid. If need be, you could pin up those spots, from where your braid seems to slip. After combing your hair, take a thick width front hair. Divide it into two. Twist the divided parts with each other, at least twice. Then take a new hair piece and place it between the twisted hair strands. Now those two hair strands should be twisted around the new hair piece. This way the new hair piece will get locked in its place. Again take a fresh piece of hair and place it between those two strands of front’s hair. Twist them around the fresh hair piece again. Keep on doing this until you reach the other side of your head. Now pin up the left out hair to prevent it from slipping down. Comb your hair and part it into two, in a straight line. Take your front’s hair, split it into two parts. Starts twisting those two strands with each other. Take the twisted hair at the back of your head and pin it. Repeat the same procedure with other of your hair. Now don’t keep any hair behind your ears. Bring it forward and cover your ears with your hair. This is it since it’s an Indian hairstyle for ethnic wears. This is kind of hairstyle with which you can effortlessly flaunt the head chains, head tiaras, dangle earrings, bindis and other such things. After combing your hair. Side part it. Then take hold of the left’s side front hair. The same must be thick enough to be twisted backward. Keep on twisting the hair until you touch your ear. Then take a hairpin and pin up your front twisted hair, just above your ears. Make use of the second hairpin, if need be. First, comb your hair. Then hold some of your left side’s hair and bring it your right side. Start braiding the same hair, until the end. Now slightly pull out the braid’s hair, so that you could make your braid headband, look fuller and thick. Pin this braid at the back of your ear. Under wedding hairstyle juda (hair buns) is an evergreen favorite among all the brides-to-be with long hair. For it is easy and light to carry with that heavy wedding dress. Here we just have revamped bridal buns. But all you brides with medium and short hair don’t be disappointed. As we have some stylish, prettifying and buns like manageable wedding hairstyles, for you too. Detangle your hair with a wide tooth comb, wide tooth combs ensures minimum hair breaks. Divide your hair into three. The hair falling on your hair shoulder should be separated from your head’s back hair. Braid all the three parts just as shown in the picture. Intertwine the first and third part by twisting them around the middle braid. No worries, if it looks clumsy, as the real rock stars would be the flowers. Take some plucked flowers, insert them on your head and braid too. Instead of using single plucked flowers, you could also wrap your ponytail with a conventional Gajra (Jasmine flower hair garland). To begin with, comb your hair with a wide tooth comb. This will prevent your hair from getting detangled. Now side part your hair. Make two ponytails out of it. Start braiding your ponytails and rubber band its end, soon after you finish. Now loosen your braid a bit. By pulling out the braided hair, lightly from both the sides. After this roll your braids in circular form, to make its bun. When you do so, pin it up nicely. Use two hair pins on each side of your head. If you neither have a roller nor hair curling rolls with you. Do one thing. Make 4-6 twisted ponytails of your hair (not braided) and rubberband it. Twist it the way you wring wet clothes before drying it under the sun. Make small buns of the twisted ponytails and leave it overnight. The next morning you can expect to see your hair as curly. Instead of side parting, section your hair from the middle. Take your front’s hair and divide it into two. Now entwine the two hair strands with each other. Pin up the twisted hair at top of your head. Perform the same step on another side of your head. This is an ideal hairstyle when you are in a mood to wear two dangler earrings along with hair jewelry like Maang Tika or Maatha Patti (Head Chains) etc on your wedding. After combing your hair. Divide it hair into three parts as shown in the picture above. The hair that falls on both the sides of your shoulder should be on the front. And your back’s hair should be tied with a rubber band. Make a bun out of the second part, if you think your hair’s slippery and that your bun would not stay in its place for a long time. Braid the same ponytail and make its bun. 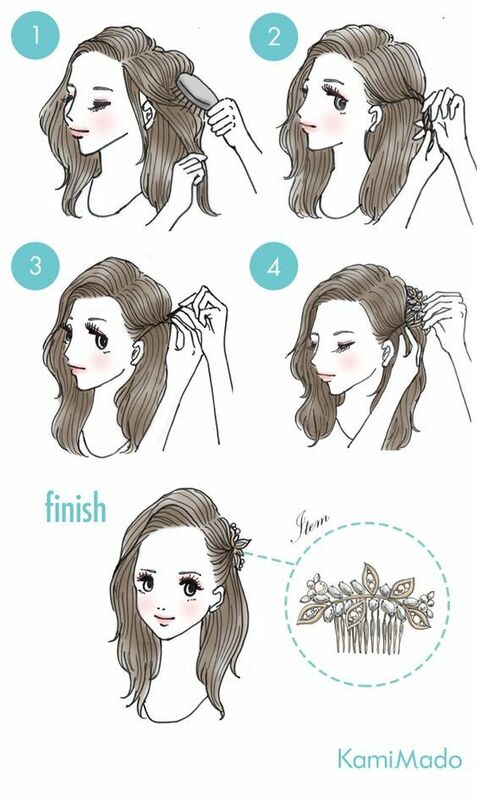 With 2 hair pins, pin the end of the bun onto your head. Then start braiding from the first and third part of your divided hair. Braiding should preferably be done from front of the head. Suppose you first finish braiding your right side’s hair, pin your braided hair on the opposite side (i.e. left side) of the hair. Use 2 pins for securing its place. Remember the braided hair should be placed above the bun. If need be, you can wrap it around the bun. Then finish braiding your left side’s hair then bring it your right side. Pin it too. You could accessorize your hair with some flowers or decorative hair pins. Part your hair into two, i.e. upper hair and lower hair. Clip you upper hair, temporarily with a jaw hair clip or condor hair clip. Then bring together your lower hair entirely, on your left side. Now unclip your upper hair and bring it towards and near your left side’ ear, fasten the same with hair pins. Use the jaw hair clip to join together your upper hair and lower hair. Use it in such a way that the clip is visible from your ear’s behind. This is why it is better to buy a big size hair clip. Since you are a bride, buy a nicely decorated blingy hair clip. After combing your hair. Part it into two. Bring your left’s side towards your right. Your right side’s hair should be towards your left. Rubberband your hair to make its ponytails. Take hold of your ponytails end and lift it up. When you will do so, a hollow hole will be formed above your rubber band. If no hole is formed, try making a hole with your finger. See that in this process, you don’t loosen your ponytail. From outside the ponytail should go inside through that hole only. After repeating Step 3 on the other side too, you will see a knot-like structure is formed. Perform Step 3 again, with the left out hair. This time it will be easy for you to do it since the hole has already been formed. Keep on knotting your hair like this, until you get a nice round/oval shaped bun on both the sides. 1 Big Flower- Freshly Plucked with small upper steam uncut/un-plucked. Comb your hair. Then take hold of your front hair. The more hairs you will hold, the more raised and big your twisted hair will look. Twist it a bit. With your other hand take a new strand of hair let its width be less than the first hair strand. This way you will get two hair strands now. Start rolling them together by bringing up the lower hair strand and bringing down the upper hair strand. This twisting of hair should be directed towards the back of your head. Keep on rolling the two strands until you reach their end. Then take a hairpin and pin up your hair in a straight horizontal position. Take the front hair at the other side of your head. Simply bring it backward. Pin up the same. Then take a big flower affix its place on your head with a small pin. Comb your hair to detangle it. After making a side partition from the front. Now take your right side’s hair and pin it up on the left side of your head. Pin up the hair from above and below. This way you will lock it properly on your head. Take your entire left side’s hair towards your right. Now pin it up as per the aforementioned way. I.e. from above and below. If need be use rest of the two bobby pins for pinning down the left out hair, hanging clumsily from your head. Then pin up the unpinned hair on top of your head. The part, just above the meeting point of left and right side’s hair. Separate the left and right side’s hair which is now mixed, by using a pin on each side. Firstly detangle your hair with a wide tooth comb. Now back-brush your front’s hair. This means bring your front’s hair towards the back of your head, now rubberband the back-brushed hair. You will get a little ponytail after doing this. Next, get hold of the hanging ponytail, lift it up and roll it under your back brushed hair. Pin up the same with a bobby pin. Now rubber band the left out hair at your head’s back. Again you will get a tiny sized ponytail. Repeat Step 3 with the second ponytail too. Lift up the ponytail and roll it inside your hair, this will give you upturned croissant bun. If you want instead of rolling the ponytail inside, you could roll it upwards too for getting a regular croissant bun. But this time use 2 bobby pins for securing its place. If you want you could use the fourth hairpin at the side of your hair. Your hair can get tangled easily or it may break due to the friction used, while removing all the rubber bands, hair pins, and hair clips etc. Hence remove all these things, patiently. You must understand that hair styling is not about getting new haircut every month. In the real sense it means making dress-complimenting hairdos every day. We just hope, with our ‘Indian hairstyles step by step’ instructional guide, you won’t feel bored with your own hair anymore.